Smuggler's Cave is a small empty cave south of Anvil (download-related). It contains only one zone, Smuggler's Cave. If the Thieves Den official download has been installed, an interior set of caves appears within Smuggler's Cave. These additional areas are all described at Dunbarrow Cove. In addition, a map marker is added for the cave with the label "Dunbarrow Cove". The following sections describe the zone of Smuggler's Cave that is accessible even if the download has not been installed. From within Smuggler's Cave, the door leading to Anvil Castle (C) is locked and requires the Smuggler's Key to be opened (from either side). 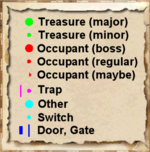 The only known way to acquire the key is from the Thieves Den download, at which point the key will appear in a chest at the foot of the Captains Quarters bed, after purchasing the Personal Quarters Upgrade. When you acquire the key, this door provides access to the Anvil Castle Dining Hall and Royal Quarters, via a set of dusty tunnels and some secret doors. The secret doors are all concealed in alcoves; the door is activated by using a Movable Pillar (coming from the cave, the pillar is on the left side; coming from the castle, the pillar is on the right side). The secret door to the Royal Quarters opens up in the eastern corner of the royal bedroom. Entering the royal bedroom is trespassing. 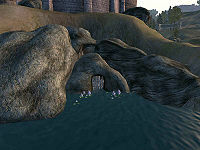 There are two entrances to this cave, one from the ocean shore (Out), and one from inside Anvil Castle (C). 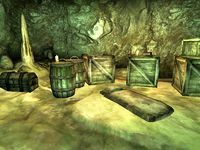 The cave consists of a single small room, with three main areas containing various chests, crates and barrels with illegal merchandise. In the southeastern area you will find a bedroll (b), a boss chest (B) and a copy of Followers of the Gray Fox. In the small lower section of the cave is a Nirnroot (N). This page was last modified on 28 October 2018, at 07:39.